Xbox One, the smash hit video game player, is not only a marvelous console to play games like - EA Sports NBA Live 14, Madden NFL 25, etc. but also an ideal device for video enjoying. As it's equipped with AMD Octa-core CPU with Jaguarx64 architecture and AMD 12 units 768 core GCN architecture GPU, it absolutely guarantees you a span-new pleasant games and video-appreciating experience. More incredibly, it supports 4K (Ultra HD) and 3D video play back that its display resolution can access to 3840×2160 pixels so as to offer the unbelievable high video quality. Consequently, it will be a great visual feast to watch videos on Xbox One. However, Xbox One as a member of Microsoft clan, must abide by its principle that it can only support the restricted file formats like MP4, AVI, and WMV. In case you want to play FLV video downloaded from YouTube or MOV video bought from iTune on Xbox One, then you require an all-in-one helper to assist you. MacX Video Converter Pro is the best video converter for Xbox One to easily convert almost any video to Xbox One just in a few clicks. 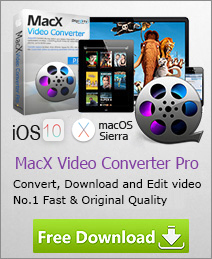 MacX Video Converter Pro is competent of converting SD videos like WMV, FLV, MOV, AVI, or HD videos MKV, M2TS, etc. to playable format on Xbox One on Mac OS. The specialty of this optimal video to Xbox One converter is the preset profiles for each version of Xbox gadgets, making it stand out from the crowd similar software. Furthermore, this video converter for Xbox One can also cater for you demands to quickly download and convert YouTube video to your Xbox one at one fell swoop. And its another beauty as a stunning photo slideshow maker and screen video recorder will satiate your wish to make an one-of-a-kind photo slideshow video and record some non-downloadable videos for offline watching. 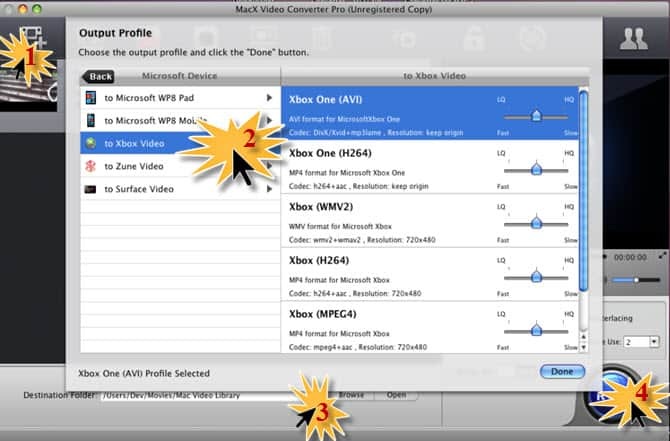 Step 1: MacX Video Converter Pro and launch this Best video converter for Xbox One on Mac. Then click "Add" button to import source video. Step 2: Choose the Output Video Format: "Microsoft Device"→"to Xbox Video"→"Xbox One". Tips: this optimal Xbox One Video Converter provides you with video editing and output settings. You can trim the video to gain a clip of the video add your own subtitles, or adjust resolution, frame rate, Bit rate, etc. to customize your own videos for Xbox One on Mac. Step 3: Opt for the Output Folder to save the output files by clicking the "Browse" button. Step 4: Press the "RUN" button start converting video to Xbox One. Besides converting video to Xbox One on Mac, this software also makes it overshadow other similar programs due to its built-in more than 280 output profiles for converting video to iPhone, iPad, Apple devices, Samsung, HTC, Android devices, Microsoft devices, etc. Provided you want to use this fabulous program on Windows OS, you can approach to MacX Video Converter Pro for Windows to transfer video to Xbox One. Still have no idea about how to deal with you're a truckload of DVD movies? Well, why not rip and back up them to your astounding Xbox console? Here shares you how to rip DVD movie for playback on Xbox console. Want to put your MKV videos to your recently-bought PS4 and enjoy them on the move? This tutorial will show you how to convert MKV to PS4 and play various HD video on PS4.